average rated life - The number of hours at which half of a large group of product samples fail under standard test conditions. Rated life is a median value; any lamp or group of lamps may vary from the published rated life. beam angle - The angle at which luminous intensity is 50 percent of the maximum intensity. center beam candlepower (CBCP) - Center beam candlepower is the luminous intensity at the center of a beam, expressed in candelas (cd). color rendering index (CRI) - A rating index commonly used to represent how well a light source renders the colors of objects that it illuminates. For a CRI value of 100, the maximum value, the colors of objects can be expected to be seen as they would appear under an incandescent or daylight spectrum of the same correlated color temperature (CCT). Sources with CRI values less than 50 are generally regarded as rendering colors poorly, that is, colors may appear unnatural. compact fluorescent lamp (CFL) - A family of single-ended fluorescent-discharge light sources with small-diameter [16-millimeter (5/8-inch) or less] tubes. infrared radiation - Any radiant energy within the wavelength range of 770 to 106 nanometers is considered infrared energy. (1 nanometer = 1 billionth of a meter, or 1 X 10-9 m). PAR lamp - An incandescent or tungsten-halogen incandescent lamp with a hard glass bulb and an interior reflecting surface, a precisely placed filament, and a lens to control beam spread. The lens is hermetically sealed to the reflector. Metal halide PAR-lamps are also now available. R lamp - A common reflector lamp. An incandescent filament or electric discharge lamp in which the sides of the outer blown-glass bulb are coated with a reflecting material so as to direct the light. The light-transmitting region may be clear, frosted, or patterned. transformer - Transformers are electrical devices with no moving parts, which change distribution voltages to higher or lower levels. When used with incandescent or halogen lamps, they typically step 120-V distribution downward to 12V, although 5.5V and 24-V models are also offered. ultraviolet - Any radiant energy within the wavelength range 100 to 400 nanometers is considered ultraviolet radiation (1 nanometer = 1 billionth of a meter, or 1 X 10-9 m). wavelength - The distance between two corresponding points of a given wave. Wavelengths of light are measured in nanometers (1 nanometer = 1 billionth of a meter, or 1 X 10-9 m) beam appearance - The description of the beam's image on a wall as determined by subjective visual evaluations of each lamp. The descriptive categories used are smooth, cloud, two-contour, ripple, and variegated. candela - The Systeme International d'Unities (SI) of luminous intensity. One candela is one lumen per steradian. Formerly, candle. dichroic coating (dichroic filter) - A multi-layer coating that transmits certain wavelengths and reflects those not transmitted. halogen cycle - Halogen incandescent lamps are in the same family as standard incandescent lamps. The basic operating principle is the same, except that chemicals called halogens are introduced in the gas fill. When electricity passes through the lamp's filament, it is heated until it glows and emits light. In this process, tungsten from the filament evaporates and, over the life of the lamp, causes the glass bulb wall to slowly blacken and the filament to disintegrate until the lamp fails. Halogens remove evaporated tungsten from the glass wall and redeposit it back onto the filament. As a result, tungsten does not build up on the bulb, so the light output does not degrade as rapidly. intensity (luminous intensity) - Total luminous flux within a given solid angle, in units of candelas, or lumens per steradian. lumen (lm) - A unit measurement of the rate at which a lamp produces light. A lamp's light output rating expresses the total amount of light emitted in all directions per unit time. Ratings of initial light output provided by manufacturers express the total light output after 100 hours of operation. luminaire - A complete lighting unit consisting of a lamp or lamps and the parts designed to distribute the light, to position and protect the lamp(s), and to connect the lamp(s) to the power supply. (Also referred to as fixture.) correlated color temperature (CCT) - A specification for white light sources used to describe the dominant color tone along the dimension from warm (yellows and reds) to cool (blue). Lamps with a CCT rating below 3200 K are usually considered warm sources, whereas those with a CCT above 4000 K usually considered cool in appearance. Temperatures in between are considered neutral in appearance. Technically, CCT extends the practice of using temperature, in kelvins (K), for specifying the spectrum of light sources other than blackbody radiators. Incandescent lamps and daylight closely approximate the spectra of black body radiators at different temperatures and can be designated by the corresponding temperature of a blackbody radiator. The spectra of fluorescent and LED sources, however, differ substantially from black body radiators yet they can have a color appearance similar to a blackbody radiator of a particular temperature as given by CCT. efficacy - The ratio of the light output of a lamp (lumens) to its active power (watts), expressed as lumens per watt. halogen lamp - An incandescent lamp that uses a halogen fill gas. Halogen lamps have higher rated efficacies and longer lives than standard incandescent A-lamps. illuminance - The amount of light (luminous flux) incident on a surface area. Illuminance is measured in footcandles (lumens/square foot) or lux (lumens/square meter). One footcandle equals 10.76 lux, although for convenience 10 lux commonly is used as the equivalent. lumen maintenance - The ability of a lamp to retain its light output over time. Greater lumen maintenance means a lamp will remain brighter longer. The opposite of lumen maintenance is lumen depreciation, which represents the reduction of lumen output over time. Lamp lumen depreciation factor (LLD) is commonly used as a multiplier to the initial lumen rating in illuminance calculations to compensate for the lumen depreciation. The LLD factor is a dimensionless value between 0 and 1. beam spread - The width of a light beam, expressed in degrees. 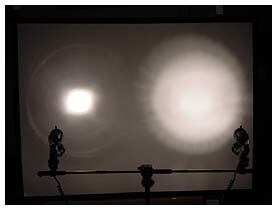 The beam of light from a reflector-type lamp (PAR, R, ER, or MR) can be thought of as a cone. The beam spread is the angular width of the cone. Common beam spreads are known as spot, narrow, narrow flood, and flood. What do I need to know when specifying MR16 lamps? MR16 lamps used in architectural lighting applications come in a variety of wattages and beam angles. MR16 lamp manufacturers such as EYE, GE, OSRAM SYLVANIA, Philips, and Ushio offer wattages that range between 10 and 100 watts and beam angles ranging from 7 to 60 degrees. Figure 5-1 shows the lighting effects produced by two lamps with different beam angles. Lighting professionals should understand the language used to identify MR16 lamps. Manufacturers usually have their own lamp codes, but there are standard lamp designations and beam angle nomenclature that make their identification easier. MR16 lamps can be identified by a three-letter code created by the American National Standards Institute (ANSI). The three-letter code represents a specific type of lamp identified by its wattage, bulb shape, and beam angle. For example, "EXN" stands for 50 watts, MR16 lamp, 40 degrees or 50MR16/40°. Lighting professionals can specify MR16 lamps by their ANSI code or by their wattage, bulb shape, and beam angle interchangeably. Table 1-1 shows a partial list of ANSI three-letter designations and their abbreviated descriptive equivalent. Keep in mind that manufacturers may sometimes use these subcategories differently. Table 1-2 shows the differences between some lamp manufacturers. This table does not provide a comprehensive list of all products or manufacturers, but it shows examples of the beam angle nomenclature used by some lamp manufacturers. Lamp manufacturers such as EYE define beam angle as number of degrees only.